The Square Room at 15’x15′ is the smallest room on our first floor. It flows directly off The Long Room, and is graced by the pair of west-facing windows you can see from the front of the house. 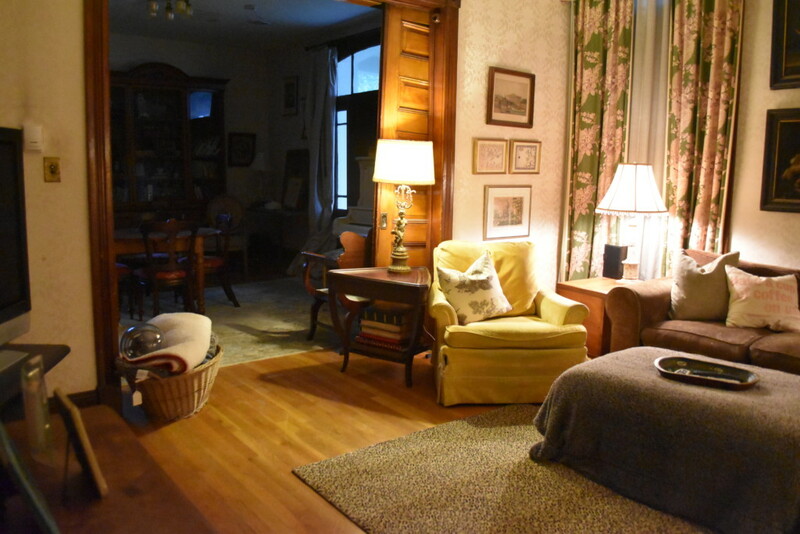 Originally, this room was the corner of the house. Once the addition was completed on the north side, however, the northern window of this room became an internal one, looking into The Glass Room. 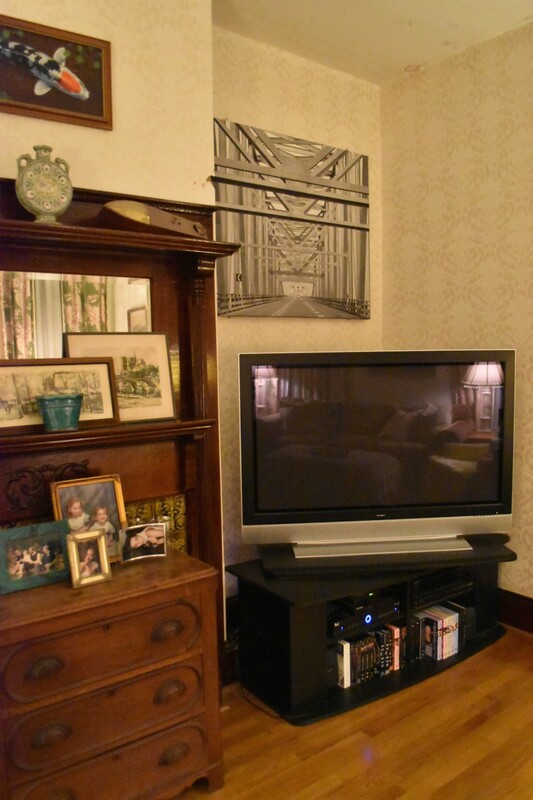 The television (Grandmother Thomas never said, “TV.”) was always in this room. 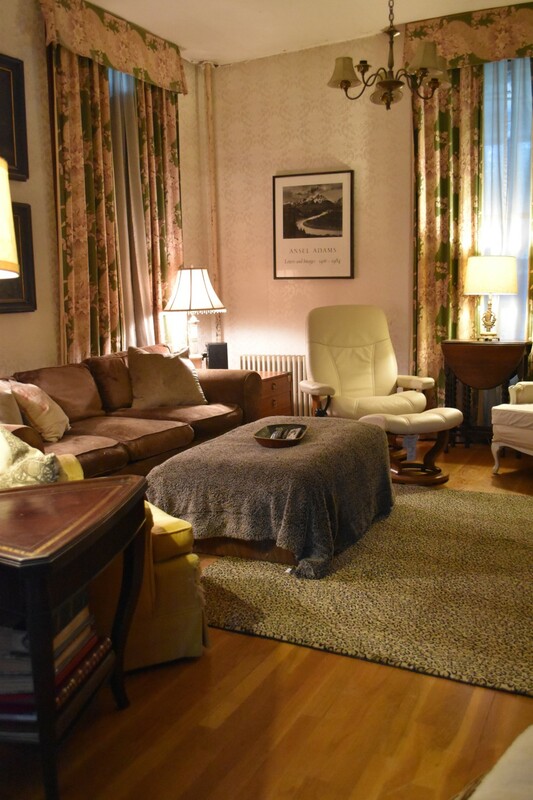 When I was a little girl, there was a deep, soft oriental rug that covered the room’s floor, and it’s where we would lounge to watch Shirley Temple, Tarzan, or Elvis movies on Sunday afternoons. Once football season started, Sunday afternoons were all about the Redskins and the Colts (during my childhood, the Colts were a Baltimore team. If you’re from this area, you’ll remember the ghostly images of the team pulling out of the city under the cover of night, heading to Indianapolis in the 1980s. . .) This is the room where we were taught to appreciate football and all its nuances (lessons Chip is so grateful I had). When it comes to this house, I realize that I am a creature of habit. Almost without thought I placed the television in this room. I placed our sofa just where Grandmother had hers. I’ve even left all three of her draperies in this room, and let them dictate the color scheme of the room, because, honestly, I like them. Why, exactly, I’m not sure, because in general I don’t like draperies. Yet these speak so clearly to me of my Grandmother and her taste. When she redecorated the house in the 70s, all the wallpaper was changed, new floors were laid, fresh carpets were installed. But the curtains remained. They are the one design element she loved so much she didn’t want to change. And they feel to me of the comfort, security, and peace I always felt in Grandmother’s home. But would I ever pick them out? If this were a house I came into with no personal history, would I have kept these curtains? My honest answer is, “No.” I love the vintage fabric, but I would never design with imposing draperies like these. So if I really plan to make this house my own, the draperies must go. Here’s a tour of the room. This is the view of the room from The Dining Room. 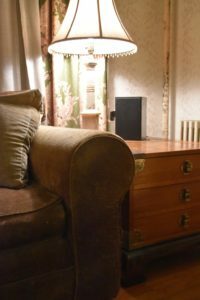 It’s the way the room is usually entered – whether bringing the tea tray in (it perches nicely on the ottoman), flowing in after dinner to watch a movie, or just buzzing in for a minute – this entry is the main one. 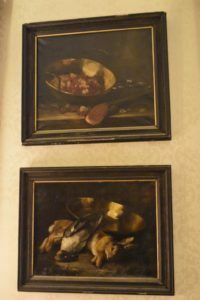 Between the two drapery-festooned western windows, I’ve hung a pair of European oil paintings. I have a passion for artwork, and particularly 17th-19th century European art. These paintings (like so many of our chairs) are gifts from my mother, who received them from her mother, Grandmother Smith who bought them at auction: the auction of her husband’s family home, Boscabel, to the public, sold because the nine bickering siblings could not come to any agreement after their parents’ death. So everything went. 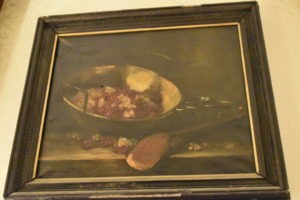 Among their many possessions was a good (not great) collection of European oil paintings and lithographs. My Grandmother Smith decided to buy as much of this collection as she could. And from it, I received these two beautiful works of art. The upper painting depicts a bowl of cherries. 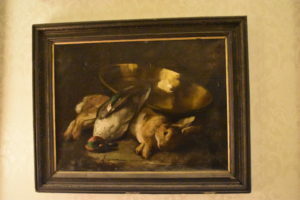 The lower painting depicts a pheasant and rabbit. I realize that the rabbit isn’t alive, yet it’s such a beautiful creature, and I love the image nonetheless. The right-hand side table is from Chip. His mother got this for him to furnish his graduate-school apartment. 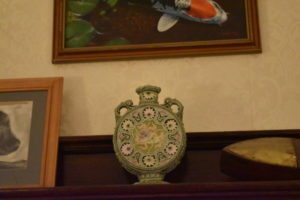 It was a studio apartment and she felt this could serve as side table and mini dresser. I never mentioned this to her, but Chip doesn’t really put things away, anyway. Her gesture was a hopeful one. The black box on top is not a 2001-esque monolith. It’s one of two surround-sound speakers that must sit behind us to maximize the effect. You see, I do accommodate function over form sometimes. This room is actually every bit as comfortable as it looks. The brown velvet sofa (Ralph Lauren Home from Bloomingdale’s circa 1990, our first big furniture splurge) is one of those deep, comfy sofas that you sink down into. The down back cushions and down-wrapped-foam seat cushions are the key. Those throw pillows are from Tuscany Designs and Silk & Burlap. The lamps are from Chip’s mom. The chair assortment is just that. You can probably tell that none of these chairs is from my mother. She tends toward elegant lines and french style. These are all just really comfortable chairs. The leather one is Chip’s and does all sorts of fancy things to help his bad back. (Actually, he feels kinda like Captain Kirk in it, but we just go with the back rationale.) The yellow one is AMAZINGLY comfortable. And, no, I most definitely did not pick out that yellow upholstery. It came to us like that, in perfect condition, and, honestly, I meant to get it to the upholsterer, but . . . There you have it. The story of so many things in my home, and in my life. 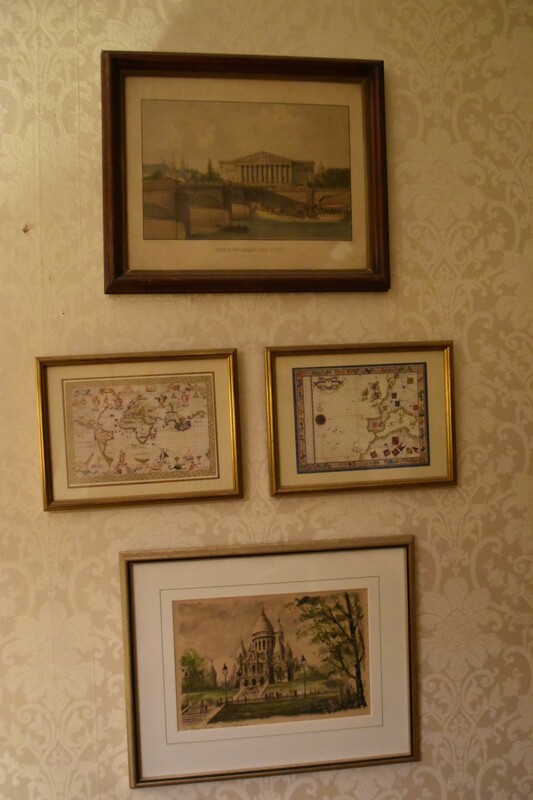 . .
On the wall, to the left of the sofa, hangs the beginnings of my watercolor collection. 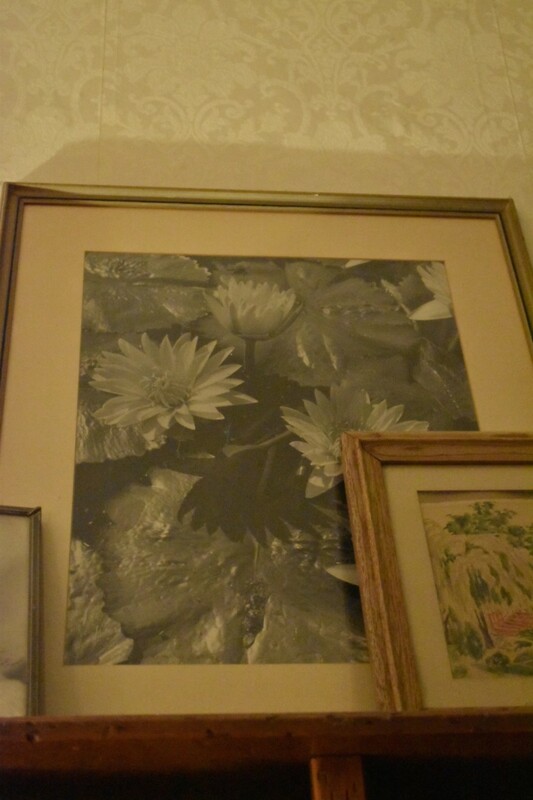 On top is a print from my Grandmother Smith. 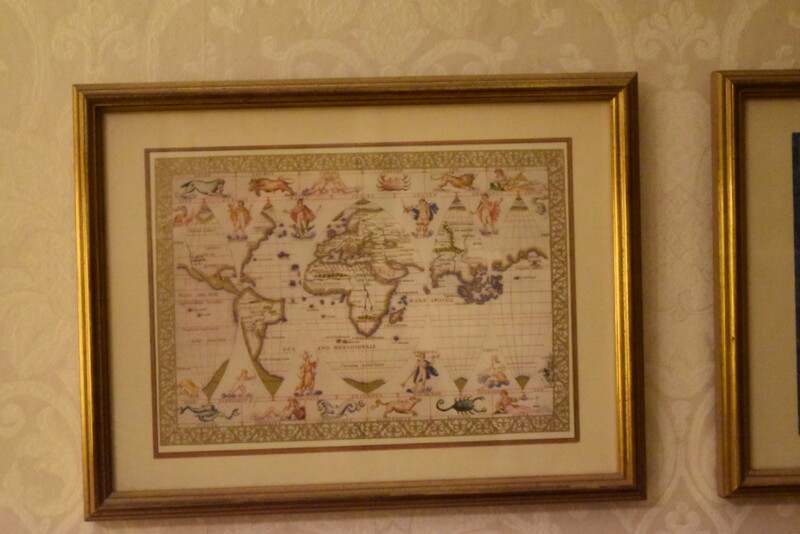 Below that is a pair of maps my parents brought back from a trip to Montreal. 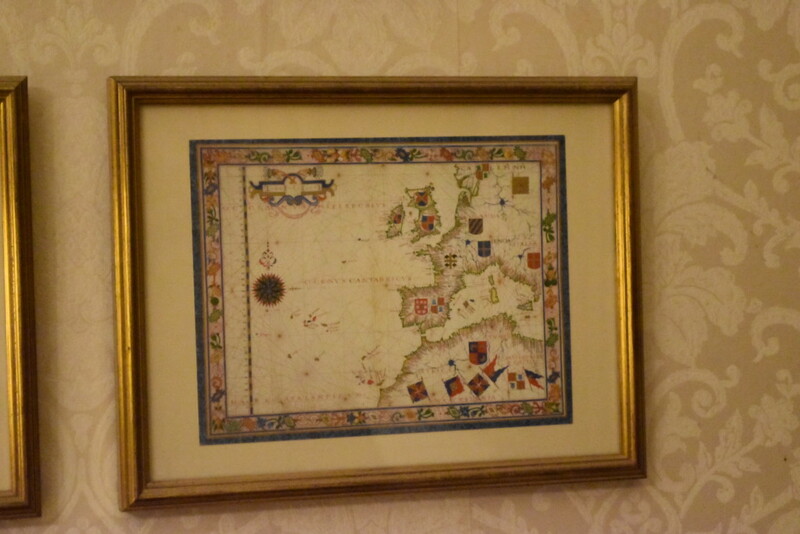 I love maps and had them framed simply in gold. Below them is one of my treasures. 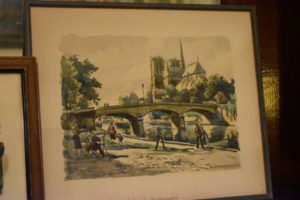 It’s a watercolor my Grandmother Thomas bought on the streets of Paris when she was there with her sisters. It’s of Sacre Couer Basilica in Paris. She was a devout Catholic and climbed all those stairs to see the magnificent church. She loved to tell the story of how the people of Paris prayed to God to forgive them, as they saw the Prussian seige of their city during the Franco-Prussian War as a chastisement from God. They promised to build a church if He would deliver and forgive them. They were saved. And the church was built. There’s just something about the image and that of all the things in Paris she could have gotten a picture of, this was the one, that makes me love this work. It also started my collection of watercolors. Here’s a view of the pocket-door wall. You can see The Long Room in the distance, but I turned out the lights to keep this room in focus. Gone is the deep, wool carpet, but we’ve made due with my impulsively purchased leopard rug. Yes, it’s too small for the room. Yes, it’s leopard. But then, again, it’s leopard. It’s fun and I wanted it. So I just decided it fits fine. Which isn’t true, but I’m going with it. That bundle over to the left is our vintage wicker basket filled with warm throws. In the winter the wind howls so that it pushes through every crack it can find. And, turns out, there are lots of them. So the throws make us all so much happier. Again, function over form. Beautiful it is not, but this TV is 50+ inches of Hi-Def and we really use it. I love anything period, especially anything Bronte or Austen. Dickens, too. And don’t even get me started on Downton Abbey and Poldark and every other BBC mini-series, I think, EVER. All that before I even mention HGTV. Or Chip’s football marathon Sundays. So, you see, we’ve come full circle: Sundays are devoted to football in season. This little jar was my Grandmother’s and this is exactly where she kept it. It’s sitting right here in the photo of this room from the 1970s. So when I got it, I knew just where it belonged. Perfect as it looks, not only have I broken it and repaired it, but Grandmother, at some point, did, too. 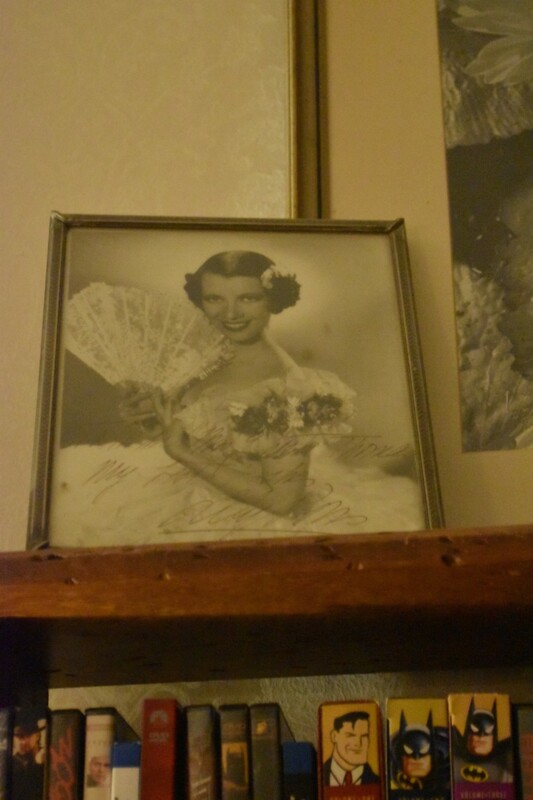 It was only after she had died, and I actually had this piece in my hands that I realized why she had it up so high all those years – from this vantage you can’t tell it was ever broken. I got this irresistible watercolor from one of my pickers. It’s my favorite view of Notre Dame de Paris. Almost every image you see of it is, what I consider the boring front facade. It’s the rear view with its spectacular flying buttresses and graceful lines that is its best side. 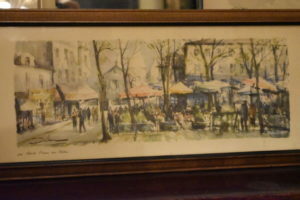 This watercolor of the art market in the square at Montmartre comes to me from a good friend who was clearing out a convent for a group of nuns. When I got there most everything was gone or going, but there were a few items, dressers, chairs, etc. for me to buy. Being Catholic myself, and having a sympathy and understanding of the nuns and their way of life, there were several things that I bought, but just can’t sell. In particular, the crucifixes that hung over each of the nun’s beds. I bought them all. But there was just something wrong, to me, about re-selling them. Another item was this picture. You see, this square sits at the bottom of the hill, below Sacre Couer Basilica. 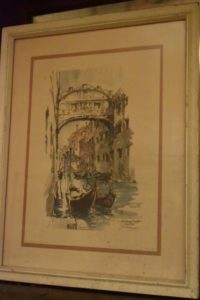 It was like it completed the image for me and so, it sits on the mantel, gazing at the watercolor my Grandmother brought back with her. 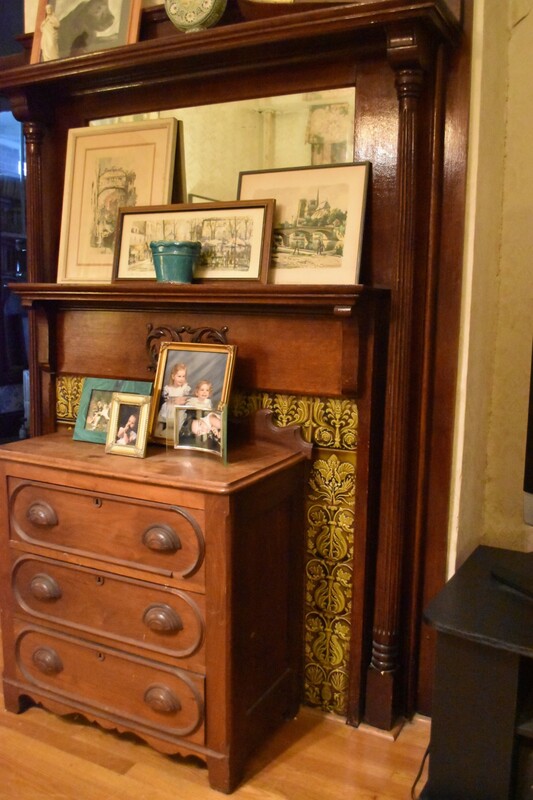 Here’s one of the most striking features of this room: the mantel. The sealed-up opening is hidden by the chest, but it’s really an extraordinarily detailed piece: columns, carvings, double shelves, mirror, tile. You’ll see as we go through the rest of the house, that this is the only elaborate mantel we have – the dining room one is very plain in comparison. The chest is from my mother’s mother, Grandmother Smith. She bought it for almost nothing, painted brown and very sad. She stripped it down to its original walnut and refinished it herself. You see, it’s in my blood. I love the piece, and have always used it to hold presents before I get a chance to wrap them. Yes, the girls do know about it. No, they never peak. That’s their claim and I’m okay with it. This is the only one of my watercolor collection that depicts a place I have not actually seen. This iconic view of Venice, Italy is just so pretty, and mixes so well with the Parisian scenes I already had. It’s from Kelley Yeomans, a dealer here at Chartreuse & co.
And this is the view of The Square Room from The Long Room. 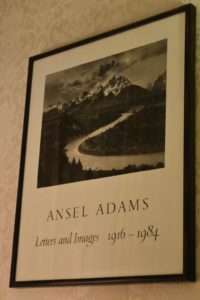 That’s a favorite Ansel Adams print, framed in rosewood, hanging on the far wall. From this angle you can see the northern window, which once looked out over the fields to the north of the house, but now looks into The Glass Room beyond. The carved bowl on the down-wrapped ottoman (which serves nicely to hold our tea tray – which is almost always in here if we’re in here) is from Chip’s mother’s travels, and holds the myriad remotes required to keep our entertainment center functioning. So art is clearly a theme here in our home. In addition to exhibit catalog books, I also have too many exhibit posters. 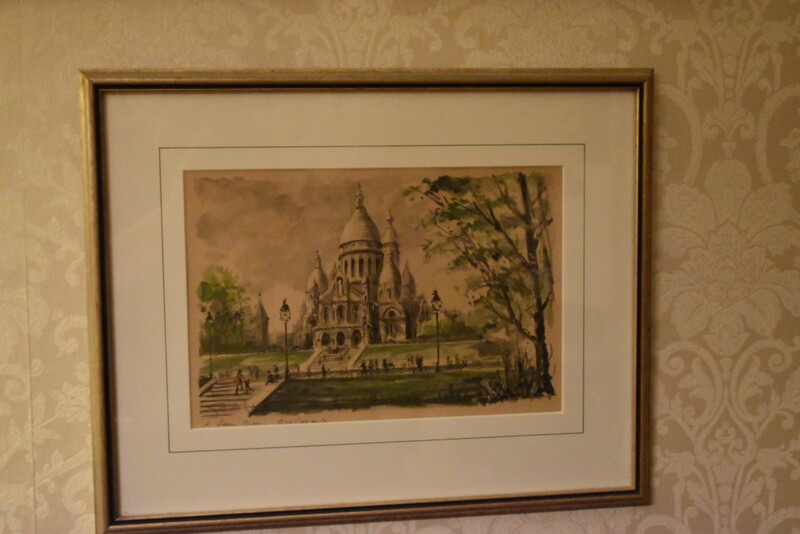 This one actually got framed – in rosewood. 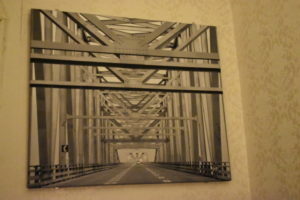 It’s a nice complement to the photograph of the Bay Bridge on the opposite side of the room. Here they are. 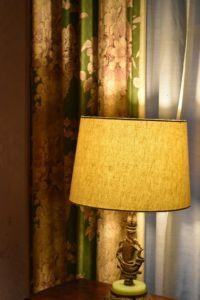 The much-maligned curtains. 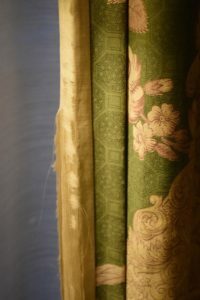 In this photo you can see the details of the fabric, and you can also see how the sunlight is slowly, but surely destroying their silk lining. Another happy find: Chip and I love the ocean, so this little brass boat, sailing upon a marble pedestal, charmed me. The shade is a bit oversized, but it’ll do till the right one comes along. 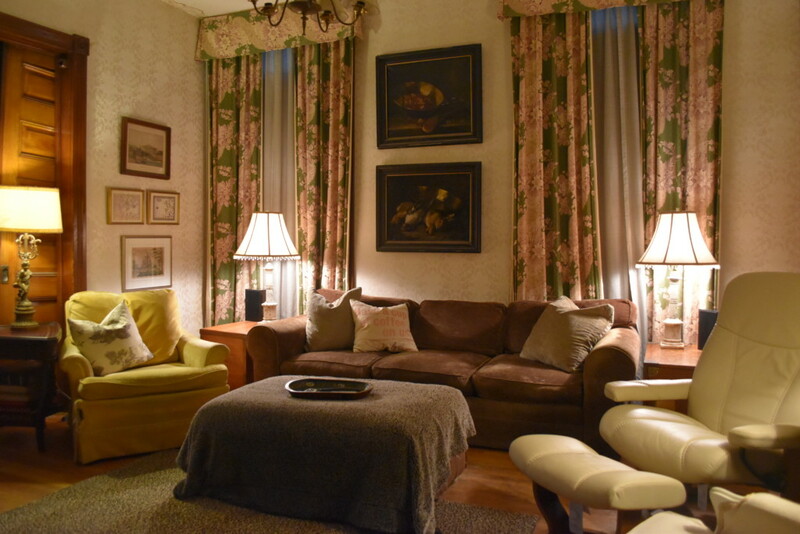 Here, too, you can see how the curtains have dictated the colors of the room: green, gold, brown, cream. Behind the door from The Dining Room stands a tall, slender, wooden bookcase which, as it turns out, is exactly the right depth for our DVD collection. It’s a collection as varied and eclectic as our tastes, in alphabetical order, and ready for easy use. 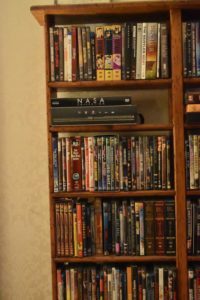 The advent of Netflix and Amazon Prime have slowed down our need for DVDs but there’s always that favorite you’re not willing to risk being dropped from the big online libraries. This piece was procured from EmmaJean’s Country Store, a dealer here at Chartreuse & co. Above the very functional shelves rest several images, all of which speak to my history with water gardening in general, and Lilypons Water Gardens, specifically. 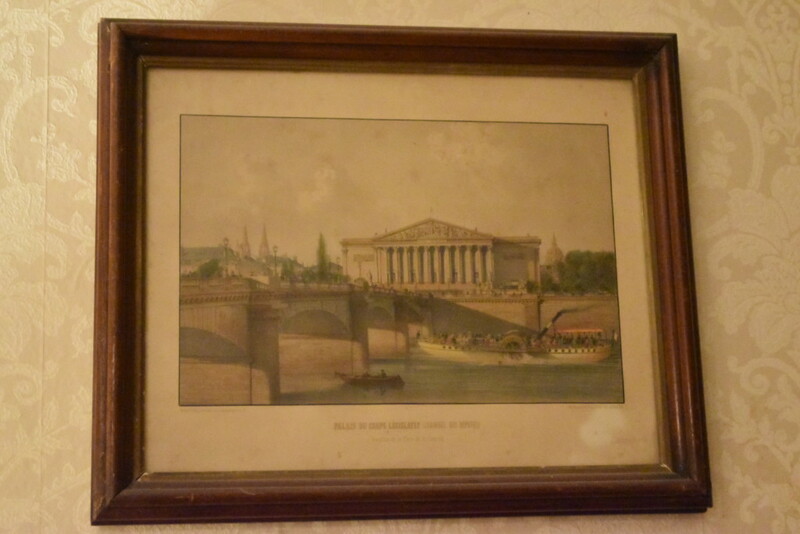 This framed photograph, shot and printed by famed Baltimore photographer, A. Aubrey Bodine, is one of a number commissioned by my Grandfather Thomas. He wanted this extraordinarily talented man to document the beautiful grounds and fascinating operation of Three Springs Fisheries, later Lilypons Water Gardens, our family business. 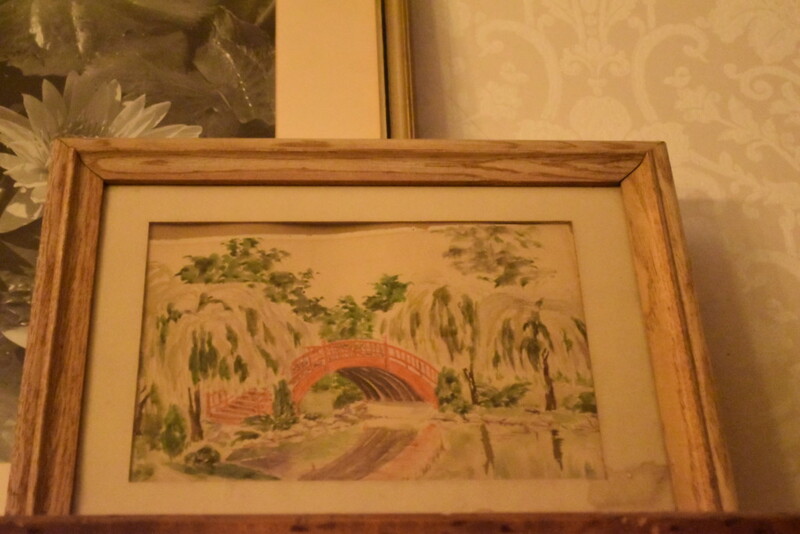 This last of my collection of watercolors is of the famed Japanese Bridge in the Huntingdon Gardens in California. Stunning gardens, which incorporate my love of gardens with my passion for art and books, definitely worth a visit if you’re in the area. We visited them during an annual International Water Lily Symposium – affairs which, in another life, I organized, managed, produced. There you have it: The Square Room. 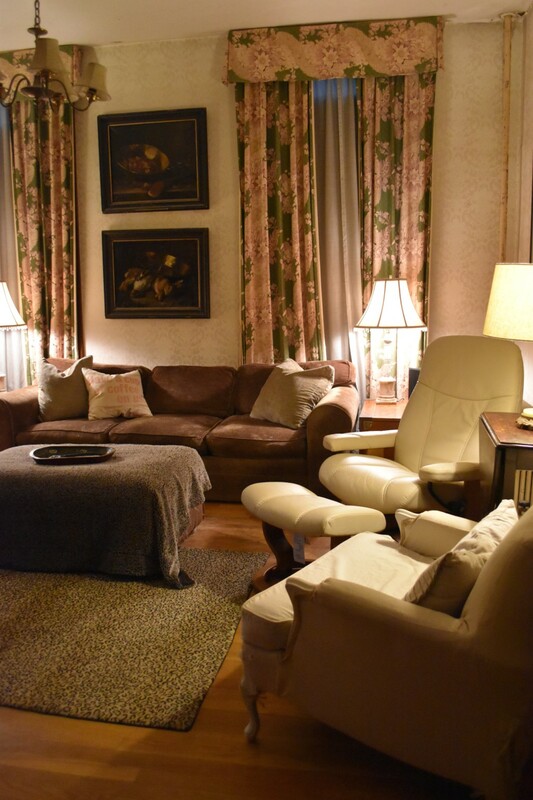 Our version of a TV room, comfortable, eclectic, full of history, a reflection of us as a family. As many times as I have visited your home along w a few times when it was Grandmother Thomas’ I don’t think I have been in this room. I love the colors and especially the pop of the yellow upholstery on the chair. You can never go wrong w leopard of course. When I saw the Skan design (much favored and dictated home style of my Danish Father in law) chair in the corner of the the photo I knew immediately that it was Chip Crum’s addition to the decor. Got to have that balance. He might have asked for a billowing over stuffed leather recliner! Of course I can never get enough of the artwork but especially love the water colors and a couple are of favorite places that we visited together! Next time you’re here, we’ll have a pot of tea in here. And yes, we climbed those stairs Sacre Coeur together and saw all those Paris sites. Some of my fondest memories…. Some of my fondest memories, Sherrin! And yup, you can always peg the Chip Crum addition to a room, lol!